Of all basic electronics logic gates, the OR gate is the most likely to produce a HIGH output. An OR gate produces a HIGH output if any of the inputs is HIGH. The output from an OR gate is LOW only if all the inputs are LOW. Table 2-5 shows the truth table for a two-input OR gate. It’s important to note that in an OR gate, it doesn’t matter how many of the inputs are HIGH. If at least one input is HIGH, the output will be HIGH. Thus, in a two-input OR gate, the output will be HIGH if either input is HIGH or both inputs are HIGH. In a three-input OR gate, the output will be HIGH if any one, any two, or all three of the inputs are HIGH. The standard symbol for an OR shows the inputs on the left, and the output on the right. Like AND gates, OR gates with more than two inputs are easy to create. No matter how many inputs the OR gate has, the output is HIGH if any of the inputs is HIGH. Multiple-input OR gates are easy to create by combining two input OR gates. In a logic network with three OR gates, which is effectively acting like a four-input OR gate: If any of the four inputs is HIGH, the output will be HIGH. You can combine 2-Input OR gates in a circuit to create OR networks that have more than two inputs. For example, OR gates might be used in the sensor circuit of a home alarm system that has more than two inputs. In this circuit, eight separate alarm sensors are fed into a network of OR gates. If any one of the inputs is HIGH, the output from the sensor circuit is HIGH. 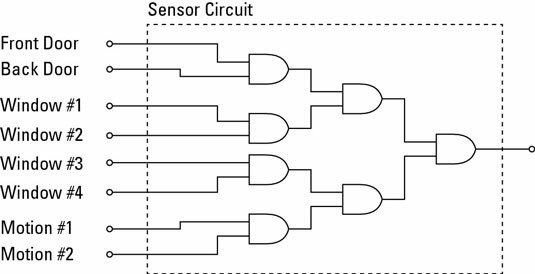 The sensor circuit uses seven OR gates to create an eight-input OR gate. Study the way that the OR gates are arranged in this network for a few moments to make sure you understand how it works. Each of the eight inputs is routed to one of the four OR gates in the first tier of gates. These four OR gates reduce the eight inputs to four outputs, which are then sent to the two OR gates in the second tier. These two OR gates reduce their four inputs to two outputs, which are sent to the final OR gate. Then the output of the last OR gate becomes the output of the entire sensor circuit.